Remember Mega Shark vs. Giant Octopus? 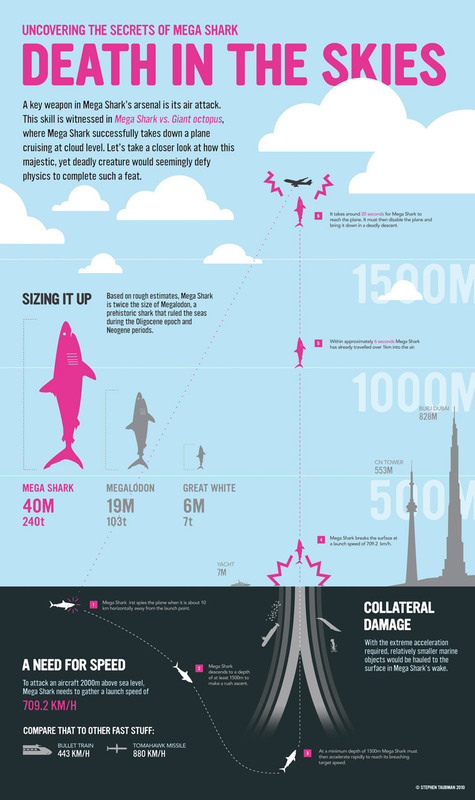 A designer named Stephen Taubman (website) has made a wonderful infographic explaining just how Mega Shark was able to take out that airliner. Click on the image below for a larger version. An even larger PDF is available at the original blog post. This explains, among other things, why we don’t need to worry overly much about Godzilla and King Kong, and why the fact that an ant can carry fifty times its own weight is not actually that impressive. Speaking of ants….I didn’t know it was possible to get short fiction about ants published in the New Yorker, but by God, E. O. Wilson has done it. The dude has got no mercy. This entry was posted in Uncategorized and tagged biomechanics, E. O. Wilson, J.B.S. Haldane, Mega Shark, physics. Bookmark the permalink.